← Very Bright Shiny Ball Shaped Object Hovers. 1 OF SEVERAL PHOTOS TAKEN OF ROCKET CONTRAIL. Description: TV stations received numerous calls of a brilliant white light in the skies beginning about 5:30 PM PST. The brilliant, but slowing light somewhat resembled a jellyfish like creature. A photo of the light taken by an onlooker is shown above. The photo was sent to a friend of mine from a lady in San Diego. The photo was forwarded to me from my friend. 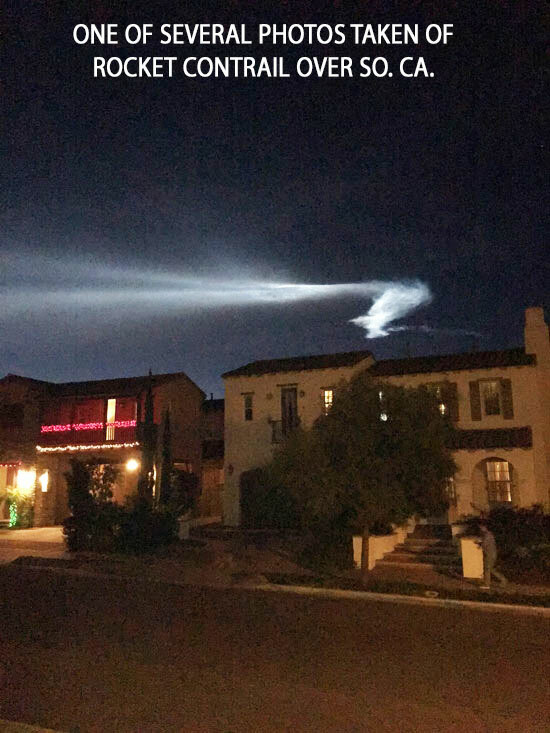 Local news outlets said that the brilliant light was from a Falcon 9 launched by SpaceX from Vandenberg AFB. This entry was posted in bright light, news-2012-onward, Photos, Possible rocket, Special Reports, UFO Sightings 2017, UFO sightings California. Bookmark the permalink.